Why I Don't Give a Damn About Today's "Big Event"
Janet Yellen delivers a long-awaited speech in Jackson Hole, Wyoming, today. Bloomberg breathlessly reported that “bond traders are desperate for direction” from Yellen. Apparently the fate of the entire world hangs on the utterances of a 70-year-old bureaucrat from Brooklyn. Look, don’t let yourself be taken in by the media hype machine. Yellen’s words carry zero heft. She’ll offer platitudes about the economy strengthening. She’ll offset that language with blather about some remaining economic uncertainty. 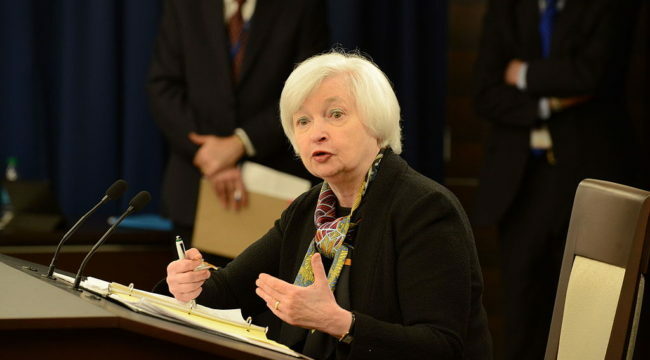 She’ll manage to hold back laughter as she says how the Fed’s decisions are based on the objective data it receives. And she’ll finish by intimating that a rate hike will coming sometime in the future… depending on the data, of course! Hundreds of cocksure Wall Street analysts will then predict when the next rate hike will come. And 99% of them will be dead wrong. There will be some short-term market gyrations on what investors “think” they heard Yellen mumble. And throughout the carefully crafted staging, the media will be “reporting” how critical it is that you pay close attention to the entire charade. That entire show isn’t for the benefit of regular investors like you. It exists to benefit its actors – the journalists, pundits and Wall Street traders who profit from it. Seriously, what’s in it for you? How do you benefit by playing along with the scam? The bottom line is nothing that happens in the propaganda before, during or after Yellen’s speech can help you reliably and consistently make big money in the markets. Absolutely guaranteed nothing. That’s why you shouldn’t devote a second of your time to acting as a “useful idiot” in support of her ­– to quote one of her heroes, Vladimir Lenin. In fact, there’s only one thing you need to care about to see outsized gains in your portfolio. It’s the single most important piece of investing wisdom in history. I talk about it in my most recent podcast, which I link to below. The one factor that could push the markets in unexpected directions. It’s not what you think. The biggest risk to your retirement. This would almost guarantee you will run out of money during your golden years. When it comes to the stock market, don’t trust anything. There’s only one exception. Click here to listen to today’s podcast. Please send me your comments to coveluncensored@agorafinancial.com. Give me your “uncensored” take on today’s podcast.